our actors to hone their skills; 2) to give our members the opportunity to review plays that are being considered for production; and 3) to give those members who are uncertain whether they want to perform an opportunity to do so in a low key manner. In May 2006, the name was shortened to just The Workshop and meetings were decreased to once a month. Saturday, January 9 at 10:00am in the Craft Room. The program is a read through of our May Production Reunion at Mt. Sanguine. Lisa Nanni-Messegee, an adjuct theater professor at GMU and NOVA, has visited us several times before and each time we benefited from her enlightened workshops. This Master Class included lecture and discussion, as well as volunteer participation in various acting exercises. A few of the topics discussed were: how to perform comfortably when having to look out at the audience, how to manage overlapping dialogue and how to make dialogue feel more spontaneous. Coffee and breakfast pastries were served before the workshop. All past HH Directors were invited to discuss their philosophies, goals and views. March 5–This was the first separate meeting the group met. Fourteen members attended and decided to meet twice a month on Saturday mornings at 10am in the Craft Room. May 7–Member Alan Mager discussed Voice Projection. May 21–Member Bets Knepley discussed Type Casting: Good or Bad. September–Member M.J. Brickach discussed Accents. At the July general meeting, Lucy Holsenbeck, from NOVA’s Alexandria Campus Drama Department, spoke to the group on the Process of Directing. Ms Holsenbeck was taken aback by our group; we were not what she “expected.” Confronted by our feisty group, she admonished us, “Don’t be scared or apologetic or tentative about what you do here.” and proceeded with much enthusiasm to encourage us to enjoy the process. Directors are courageous persons with heart and head to take it ALL on. Step One of the process is selecting a play. Things to be considered are the space available, talent, money. Step Two, once the play is selected, is text analysis. Read and reread the text to figure out what is going on surface and subsurface. To demonstrate the subtext messages, Ms Holsonbake asked for volunteers. Helen Esposito and Arlene Maroney bravely stepped forward. They were asked to play mother and daughter and communicate with numbers instead of words about a missed curfew. They communicated their intentions and feelings without benefit of verbal cues. Very effective! In the second exercise to demonstrate the use of tone and inflection to communicate feeling, Pat Dews sat in a chair. 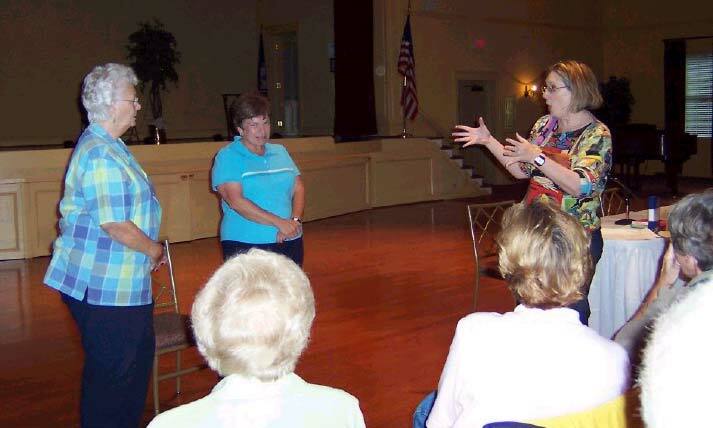 One by one, four other of our members came in and greeted her using one word, “Hello.” Each one performed it differently and a wide variety of meanings could be taken as to the relationship and how the speaker felt about the person sitting in the chair. Both exercises were used to show that motivation can be shown by nonverbal actions and by tone and inflection. Ms Holsenbeck reminded us to always have motivation for our actions on stage. Step Three of the directing process is the audition. Ms Holsenbeck did not go into detail on this. Step Four is design and collaboration. The director sits down with the team (set design, costumes, music) to get a “unified” vision. We were advised as directors to tear pictures out of magazines and collect images and music that inspire us. Use that imagery when we talk to the team of designers. Stage Five is staging, telling a story from picture to picture. Study composition, great works of art, to help in learning composition. In staging, the actor is the focus not the set. Actors should cross in front of furniture. and performances. She also stated that every Director is different and it is best to be sure to ascertain at the first staff meeting what the Director expects from the Stage Manager.